We are narrowing in on the source. The story, by now, is pretty well known in scientific circles. On September 14 of last year, the ultra-sensitive detectors at the Laser Interferometer Gravitational-Wave Observatory (LIGO) facilities in Washington and Louisiana rang with the unmistakable resonance of shattered spacetime. It was exciting stuff—two black holes, about 29 and 36 times the Sun’s mass, collided and merged over 1.3 billion years ago, ringing the fabric of spacetime like a bell. The problem, however, is that the event—designated GW150914—could not be traced to a specific location in the universe; since only two detectors registered the signal, no triangulation could be made, and the event could only be tracked to a broad swath of sky in the Southern celestial hemisphere. But NASA’s orbiting gamma-ray observatory, the Fermi Gamma-ray Space Telescope, may have changed all that. The Fermi team calculates a less than 0.2 % chance that the detection could have been random noise so close to the source of the GW150914 event. The signal was a weak burst of high-energy X-rays that lasted about a second; since it occurred below the telescope and at a high angle with respect to the GBM, the team was unable to locate the source with high precision. But there was a lucky break for the team—the Earth blocked a significant portion of the signal’s likely location, which meant they could further narrow down its source. 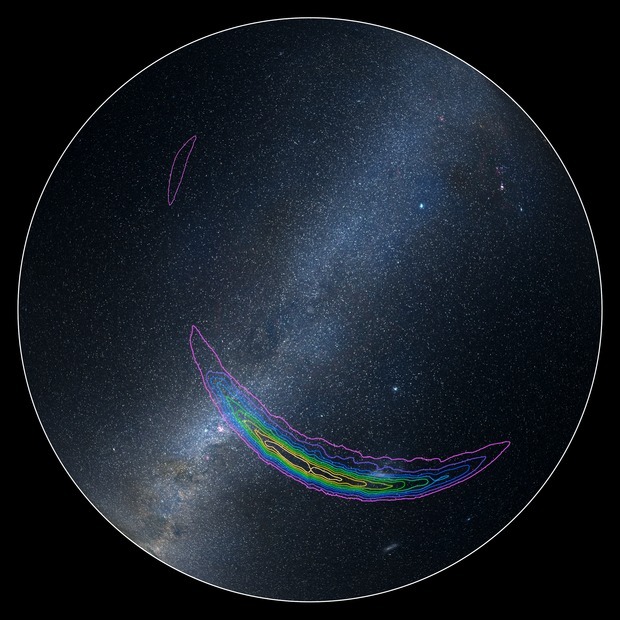 It means the portion of the sky thought to contain the GW150914 event can be whittled down by about two-thirds, which certainly reduces the area to be scanned—substantially lightening the proverbial “needle-in-a-haystack” search confronting astronomers. Some scientists dismiss the GBM detection as spurious, or coincidental and unconnected to the GW150914 event, since it was believed black hole mergers would be “clean”—that all matter in their vicinity would long since be exhausted, and that the coalescence of these bizarre objects would leave no fingerprints, save the vanishingly ephemeral ones of gravitational waves. But astronomers have been wrong before, and theorists are scrambling to develop scenarios in which a merger would produce electromagnetic radiation. Meanwhile, the real importance of the Fermi detection is that it opens the possibility of observatories working together to locate the sources of gravitational waves and further understand them. “There is an incredible synergy between the two observations, with gamma rays revealing details about the source’s energetics and local environment and gravitational waves providing a unique probe of the dynamics leading up to the event,” explains Lindy Blackburn, a member of the LIGO Scientific Collaboration.